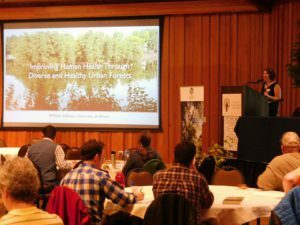 Oregon Community Trees, Oregon Department of Forestry, and the US Forest Service organized a full day of impressive speakers, spirited discussion, and thoughtful debate about the future of urban forestry at the World Forestry Center June 1. More than 150 people attended the event in Miller Hall. Dr. William Sullivan, Director of the School of Landscape Architecture at University of Illinois, Jill Jonnes, author of the new book Urban Forests: A Natural History of Trees and People in the American Cityscape, and Dr. Paul Ries of Oregon State University College of Forestry were featured speakers. The World Forestry Center has sponsored and hosted state and regional urban and community forestry conferences since 1992. Many thanks to Senior Fellow Rick Zenn and the Oregon Community Trees board of directors led by Ruth Williams of Davey Resources Group for supporting this great partnership.